French is often considered as the language of love and romance. And even the most innocuous French words can knock ladies off their feet! This is totally an exaggeration, of course, but if that’s what innocent French words can do, can you imagine the impact truly romantic French words can have? 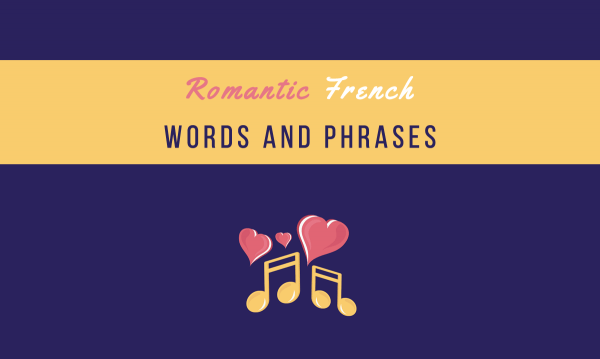 In this list, we’ve compiled the most romantic, swoon-worthy French words, phrases, and expressions. You can use this to woo your amour or bust these words out during special occasions like Valentine’s Day or your anniversary. Totally up to you. Enjoy! For more romantic topics, you can check out this article about the best places in Paris for honeymooning couples and this article about French terms of endearment. This list is also available in PDF format if you sign-up to the newsletter. You will not only get my newsletter but also a French learning package containing tons of FREE resources. If you have already signed-up to the newsletter, check the link you received before. The PDF is already uploaded there. First, let’s start with the simple words. Now for some phrases that are sure to win the heart of that special person you’re eyeing… or make your long-time lover fall in love with you all over again. Tu es très jolie. You are pretty. Tu es mignon. You are cute. J’adore ton sourire. I love your smile. Tu es charmante. You are charming. Je pense toujours à toi. I always think of you. Tu me manques. I miss you. Je veux être avec toi. I want to be with you. Tu es ma joie de vivre. You’re the joy of my life. Je suis fou de toi. I’m crazy about you. M'apprécies-tu? Do you care for me? Est-ce que tu m'aimes? Do you love me? Je t'adore I adore you. Je pense toujours à toi. I always think about you. Tes yeux, j’en rêve jour et nuit. I dream about your eyes day and night. Je ne peux pas vivre sans toi. I can’t live without you. Tu es l’amour de ma vie. You’re the love of my life. Je t’aime de tout mon coeur. I love you with all my heart. Tu veux sortir avec moi? Will you go out (on a date) with me? Veux-tu être mon petit-ami? Would you like to be my boyfriend? Veux-tu être ma petite-amie? Would you like to be my girlfriend? Je veux être avec toi pour toujours. I want to be with you forever. J’ai envie de toi. I want you. J'ai besoin de toi. I need you. Fais-moi l’amour. Make love to me. Veux-tu m’épouser? Will you marry me? Je t’aimerai pour toujours. I will always love you. Elle est ma fiancée. She is my fiancée. French is a sweet, sultry language that could charm the socks off of anyone's feet. Be sure to use these words properly so you won't end up breaking any hearts! For more French phrases, get your copy of French Phrasebook below.